It's not an addiction if I can admit that I have it, right? 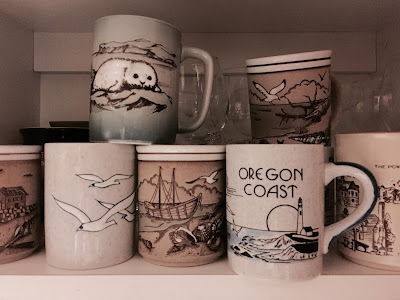 Like my sweater addiction, I have an absurd addiction to vintage mugs. This began years ago when I began collecting vintage Fire King dinner ware and dishes. 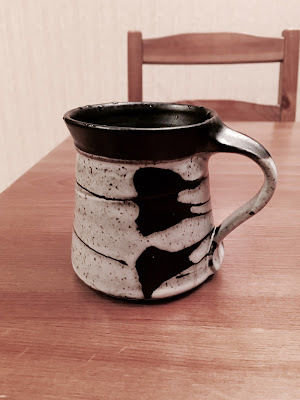 I drink from Fire King, or one of my other vintage mugs, every day. 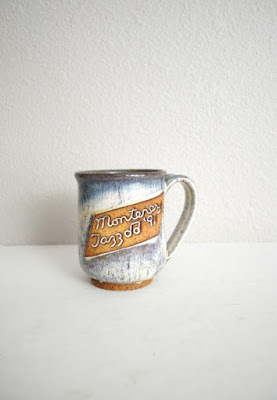 And I'm not the only one who has a thing for mugs. Sometimes, you find THE one that fits perfectly to your lips, makes the coffee (or tea) taste better, and you wouldn't trade it for any other. I feel this way about Fireking. 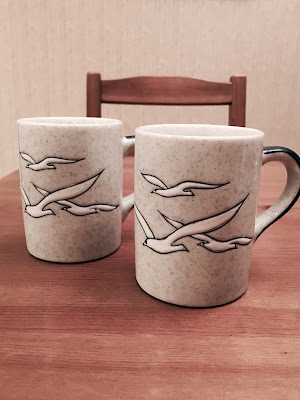 When I hop into thrift stores to find vintage clothing, a couple times a week, I inevitably meander over to the mugs. Okay, the mug section of all thrift stores are hilarious. You have the outcast mugs, the ones maybe only one person wants, the ones that are chipped, the ones that are cracked, the mug from the trip to Arizona, the mug from Disney World. The hand made mugs to the cheap, ugly-as-heck mugs. The mugs from Pottery Barn, to the mugs from Target. I've seen them all. But, these vintage 70s and 80s etched ones, or the pottery ones, are what get me. I sell them in my shop. But as of late, I end up picking them up for myself. And sneak them into my overflowing cupboard. I know my husband has found it when he says, "When did we get this one?" Actually, he's stopped saying that. And for good reason. This is my favorite shelf in my cupboard -- the top shelf, shelf. Yeah, those mugs are that special. Away from the kids, away from flying food, away from me, even. I mean, I can barely reach them. The wine glasses are up there, too. Kind of an important shelf. But geez, I love them (mugs and wine glasses.) I may or may not sell the ones I found today... crap. This was seriously my favorite mug. Well, ONE of my favorites. I totally understand the crazy infatuation with the perfect mug.